Woodland Indians Forum / Incorrect census. Indian as white, incorrect age. » Incorrect census. Indian as white, incorrect age. Re: Incorrect census. Indian as white, incorrect age. What culture did they come from? Ok, sorry for the erratic posts today. The best way for me describe mine and My wife's culture is genizaros. I have a genetic propensity for the cryptic. We both have backgrounds that are similar mixed nations. I trust you. I just never seem to agree with you. Hi, I'm sorry. Some of the things I state are out there, and I'm uncertain of the minefield of people's beliefs and do not want to hurt anyone. Well... We all have a right to our opinions. You might be right. You might be wrong. Same with me and anyone else here. euoropean roots have not been found, but a family rumor of German Jewish on my side with scant evidence. I an not afraid of the word race, It is not scientific. If we were truly different races, when we mated we would have mules for children. The subject is easier to think about if you think about us (my family) in terms of animals, I have two Chihuahua dogs one albino apple head and one red deer head, both are pure bread dogs(yet look radically different) if they were to mate it is a fact that not even one litter could be predicted on the outcome of the puppies. This is a fact in this particular breed. When you find mixed nations people, you never know what your going to get. White maybe a skin color, but it is not a race, it may be a mindset-thats politics. Ive got a picture book that shows native people from california with dreadlocks. 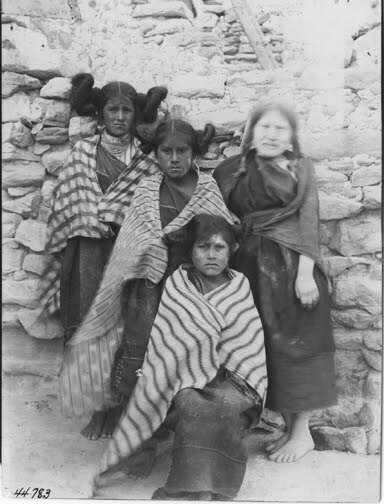 the picture below is of Hopi people. You are confusing "race" with "species." Two different things. Races are "varieties" of "species," to use the scientific terms. You're not breeding a horse with a donkey. You're breeding two varieties of the SAME species. Who ever said that "race" meant "species." That's preposterous! Like the strong genetic differences between a Arabian horse and a quarter horse. The are completely different in almost every way but they are the same species. My brother told me about the different biological "quirks" in the different races and how they affect they're health and Ray is right there are big genetic differences between races some of them from interbreeding with other species of Homo such as Neanderthals and Denisovans. sschkaak, what term do you feel comfortable using describing the difference between the Hopi people I pictured above? I know they are of the same race and species. The term I'd use to decribe their differences is "phenotype" - "The physical appearance of an organism as distinguished from its genetic makeup." phenotypes go deeper than the just appearance. That may or may not be true. Nevertheless, that's the word I would use. What word would you use? Sorry to interrupt but this photo does have some issues. Can I ask for a source site on this please? That is a fine word, as far as deeper. One would have to study the particular features of Albinism to know how deep they go, coupled with thousands of years of isolation and bitter cactus makes for some very unique peoples. Albinism has nothing to do with race or even Homo sapiens. It's a genetic fart that happens in all types of animals. My family has bred horses and beagles for generations and it just randomly happens. murdered because of their condition and it is a fact albinos have been traditionally revered and have grouped together differently in different cultures. If you need evidence to support the assertion I made about the receive becoming the dominant, look at the livestock as food trade and see all of the white animals being eaten everyday. maybe I should change my avatar to white bison? I think that's probably a typo for "fact"--though I'll let NP say what he meant by it. (Maybe, he meant it as "genetic mutation"?) You're absolutely right about albinos being treated in various ways by different cultures. To me, they're just human beings (albino people, that is). One of my favorite blues guitarists is albino: the late Johnny Winter. What a very different subject than race, though! By the way, albinism has no effect on bio-geographical DNA testing. You really have to be less cryptic. Teasing who? If you mean all those Wannabes in the "Hall of Shame" section of this forum--Sorry, they deserve it. They're not Indians. See my last post in another thread, its not what I do, its who I am. That's what I was trying to say. It knows no biological bounds. This statement had me giggling last night, in human cultures the trait has created its own biology because of social stratification, in the wild it would be a fart that would leave the animal vulnerable because of a lack of natural camouflage and an extreme sensitivity to the natural environment . In isolated human communities (before columbustus) the trait was interspersed into the general population and singled out in specific families and clans, thereby normalizing the condition and also creating an entire separate branch of albino traits. Concluding, it became camouflaged! If you look into the word Caucasian, the recent research has made the word obsolete! I've run across, I think my Great Grandmother's brother on a census, and he's listed as Mulatto. Everyone else in the family as white. I have to ck this one out more! Time period, mulato could have been mixed Indian too. Continuing, the Novel Gene Mutation OCA Variant was noticed throughout the Americas in the past and present. In witnessing Blue-green, hazel and grey green eyes. Blonde , flaxen, golden yellow reddish brown even red hair in all tribes in varying degrees. There are many ethnographic reports of the same with varying descriptions by different authors. Cleaning up facial bair before a photo shoot was typical as seen in Curtis history.